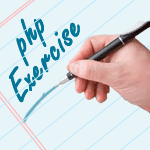 Write a PHP script, which will return the following components of the url 'https://www.w3resource.com/php-exercises/php-basic-exercises.php'. URL stands for Uniform Resource Locator. It is used to specify its location on a computer network and a mechanism for retrieving it. A URL is the fundamental network identification for any resource connected to the web (e.g., hypertext pages, images, and sound files). Previous: Write a PHP script to get the current file name. Next: Write a PHP script, which changes the color of the first character of a word.